When I was growing up my Mother would take me shopping downtown. One of my favorite memories was going to lunch with her and ordering a tuna fish sandwich on toast with lettuce and tomato, a side of French fries and a Coke. When I didn’t feel well, my Mother would make me a tuna fish sandwich and it made me feel better. My sandwich of choice…you can only guess! 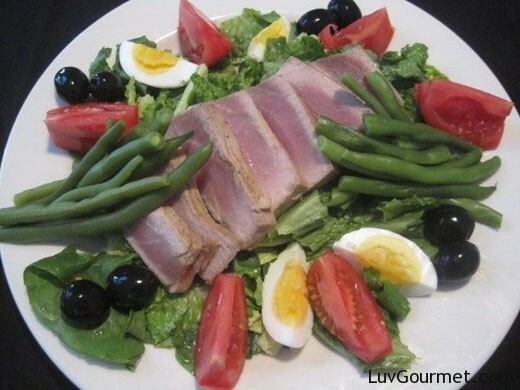 As an adult, my taste turned to fresh tuna and one of my favorite ways to prepare it is a Tuna Salad Nicoise. Not only is it tasty and easy to make; but its presentation is beautiful and gets the salivary juices flowing. Let’s not forget that it is a low caloric dish; and therefore, a healthy one. Season Tuna with salt and pepper and sear in a skillet on each side. Tuna should be rare in the inside. Boil new potatoes for 20 minutes or until desired softness. Cool and cut in quarters. Blanch Haricot vert which are French green beans, till al dente (crisp to the bite) in boiling water and plunge in ice water to stop cooking and keep color. Assemble plate. What a beautiful salad! Love your blog!